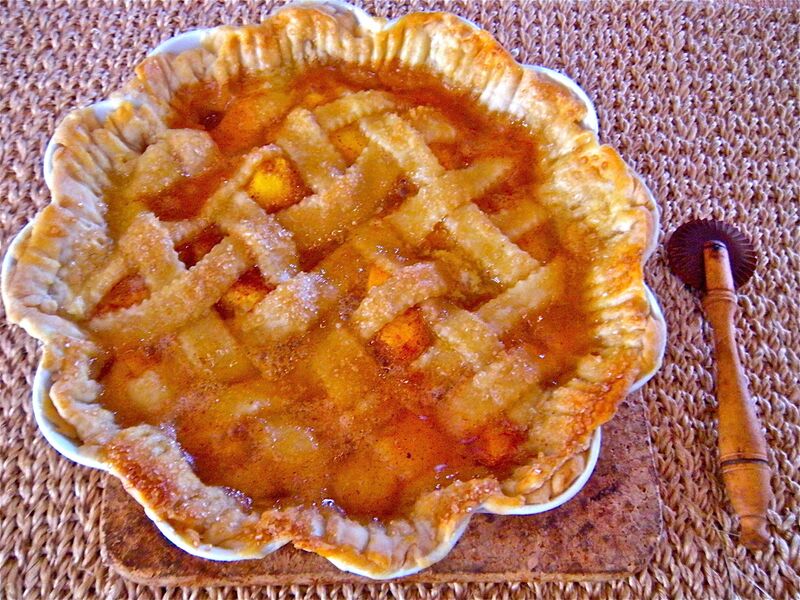 national peach pie day! . . . Someone said that today is National Peach Pie Day. Shortcrust pie crust made this a.m. in small food processor: 1 cup flour, 1/3 stick cold butter, 2 Tablespoons cold lard; 4-5 tablespoons ice water. Whirred dry ingredients until blended, then added ice water until blended into a ball– wrapped and refrigerated until ready to use. These lattice strips were cut with a vintage handmade wooden pastry wheel. Brushed with egg wash and sprinkled with turbinado sugar. Baked at 375 for 15-20 minutes until brown and bubbly. Will serve with a scoop of Haagen Daz vanilla ice cream on warm pie after supper tonight.